Professor Hazel Hall is Director of the Centre for Social Informatics within the Institute for Informatics and Digital Innovation at Edinburgh Napier University, UK. Hall’s main research expertise and teaching interests lie in information sharing in online environments within the context of knowledge management. Other themes in which she maintains an active interest include social computing/media, online communities and collaboration, library and information science research, and research impact. Dr Alison Brettle is a Reader in Evidence Based Practice and information specialist in the School of Nursing, Midwifery & Social Work at the University of Salford. Her teaching and research interests include evidence based practice, systematic reviews and systematic review methodology, information literacy, the evaluation of library and information services, and effective literature searching. Alison has published widely in these areas, as well as serving in various editorial roles on the Evidence Based Library and Information Practice Journal, including Editor-in-Chief 2011-2014. Within the School of Nursing, Midwifery and Social Work Alison is Post Graduate Research Co-ordinator leading and co-ordinating research training for PGR students and as well as leading the PhD programme. She also leads the post graduate Evidence Based Practice Module within the School. She serves on the College level advisory committees for Ethics as well as the College Research and Innovation Committee and the University PGR Forum and Post Graduate Research Advisory Board. Externally Alison serves on a number of international, national and local committees, including the Chartered Institute of Library and Information Professionals Library and Information Research Group (LIRG) in the role of awards co-ordinator, the International Programme Committee for the EBLIP, ISHIMR, and ASIS&T conferences as well as for this EAHIL+ICAHIS+ICLC Workshop 2015. 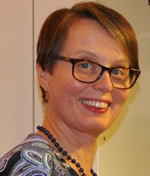 She is external examiner for the MA Library and Information Management and MSc Information Management at Manchester Metropolitan University and the MSC Health Informatics at Sheffield University. Dr Johanna Rivano Eckerdal is an Associate Professor at the division of Archival Studies, Library and Information Studies and Museology (ALM) at the Department of Arts and Cultural Sciences at Lund University, Sweden. Her teaching at the ALM-master program includes information literacy, information seeking, problem based learning, qualitative research methodology, and teaching and learning within archives, libraries and museums. Further she tutors master and PhD students. Her thesis (received the Highly Commended Award of the 2012 Emerald/EFMD Outstanding Doctoral Research Awards in the Information Science category) concerned information literacy within the context of sexual and reproductive health focusing on how young women evaluate information sources before choosing a contraceptive. Dr Liz Grant is Assistant Principal Global Health and Director of the University of Edinburgh’s Global Health Academy. She is responsible for a wide range of inter-disciplinary on-line global health programmes at the University, and co-directs the new Masters in Family Medicine, MSc Global Health Non Communicable Diseases, MSc Global eHealth and is a lead within the Certificate in Global Health Challenges, part of the University’s flagship MSc in Global Challenges. Liz’s research portfolio covers global palliative care, faith and health intersections, primary health care training and mhealth in low income countries. She is the Lead for the Central Area Sub-Group of the College Equality and Diversity Committee and previously worked for the Scottish Government as Health Advisor in the International Development Team, for NHS Lothian Public Health Directorate as a specialist in international health, and in the 1990s was based in Kenya working as a Community Health Advisor. Liz is a trustee for the international disability and rehabilitation charity CBM, Medsin and for Bioclimate research and development, and she is a passionate proponent of equitable accessible palliative care especially for those in low and middle income countries, leading a £1.5 million DFID/THET funded grant to help integrate palliative care into the health systems of four African Countries. Liz was recently elected onto the Board of Directors on the Consortium of University for Global Health for a three year term beginning March 2015.